Man, that’s a long recipe title right? And it’s really still missing a few components like the grilled chicken and broccoli, but I didn’t think it needed a full paragraph for a title. This is an old recipe from the archives that I recently rediscovered, and I enjoyed it so much I though it deserved a second go-round. 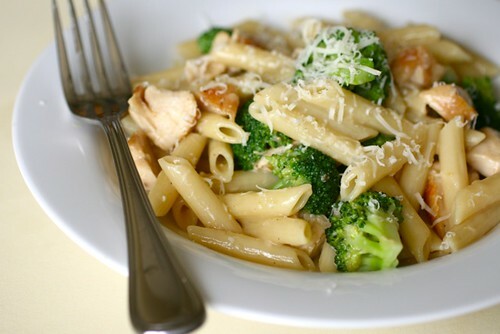 It’s easy enough to throw together pasta with some cheese, protein and veggies and get a pretty decent meal out of it. I really love this meal though because all the components combine to make something really special. The roasted garlic provides a ton of rich flavor to the sauce without making it heavy. This meal is very adaptable – quick enough for a weeknight, but nice enough for company. Just make sure to plan ahead and roast the garlic in advance! *To make roasted garlic paste, peel the outer papery skins off two heads of garlic, leaving the heads still intact. Slice about a quarter off the top of each head so that all of the cloves are partly exposed. Wrap the heads in foil and bake at 350˚ F for one hour. Remove from the oven and let cool. Once cool enough to touch, squeeze the garlic cloves out of the peels and smash with a fork to make roasted garlic paste. Meanwhile, in a large skillet or saucepan set over medium heat, melt the butter. Once the butter is melted, whisk in the roasted garlic paste and cook just until fragrant, 30-60 seconds. Whisk the flour into the mixture and cook, stirring constantly, until the mixture begins to turn golden brown, 1-2 minutes. Stir the white wine and broth into the pan. Bring to a simmer and cook, stirring frequently, until slightly thickened, about 2 minutes. Whisk in the cheddar and stir until melted. Season the sauce with salt and pepper to taste.